Isehiro is an upscale yakitori restaurant chain with its main branch in central Tokyo, not far from Tokyo Station. It was established in 1921, which makes it the oldest yakitori restaurant in Tokyo. It had a number of very famous customers during its history, one of which is Ozu Yasujirō (1903-1963), claimed to be the best movie director of all time. The first floor (ground floor) is very small with just a couple of seats. The second floor is larger, but still small with a limited number of tables on tatami. This type of restaurant is usually where business contacts take someone out for dinner. Not a place for tourists. 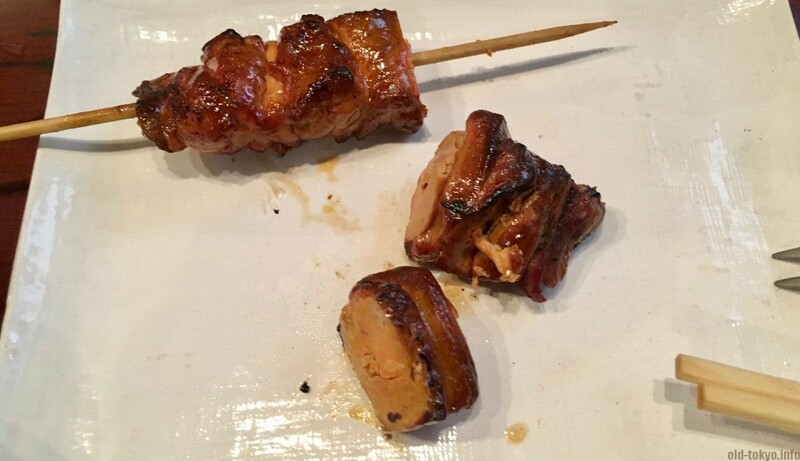 The yakitori were very good, a little bit too well-done at times, but overall a very nice and good taste. The ingredients come from various places in and around Tokyo. Only the best ingredients are selected, such as hand-made salt from Shizuoka. I had one of the evening courses in which the yakitori come one by one. 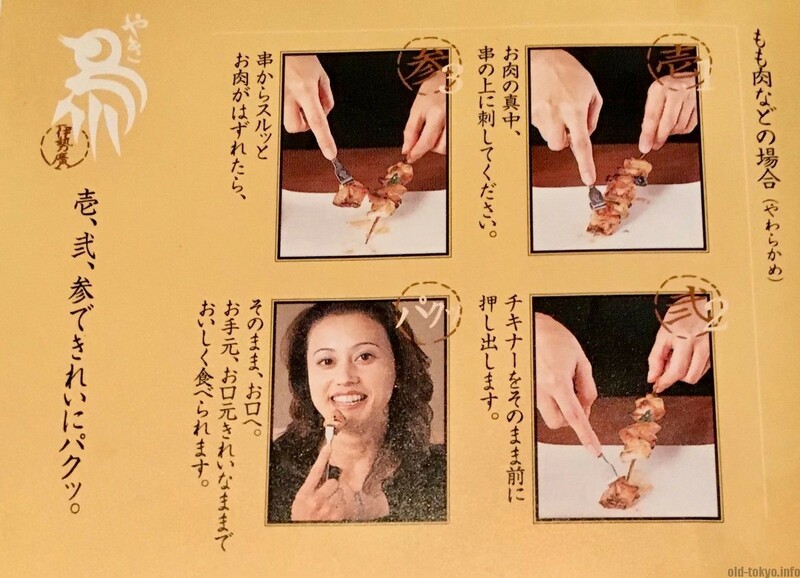 Taking the chicken of the skewers is very easy at this restaurant as you get a dedicated tool to do that. It’s a metal stick with one of the ends bent 90 degrees. No clumsy maneuvering with chopstiks to take those pieces off (by the way, you are not supposed to eat directly from the skewer). You can adjust the taste with sanshō (Japanese pepper) or shichimi (7 herbs, very spicy). 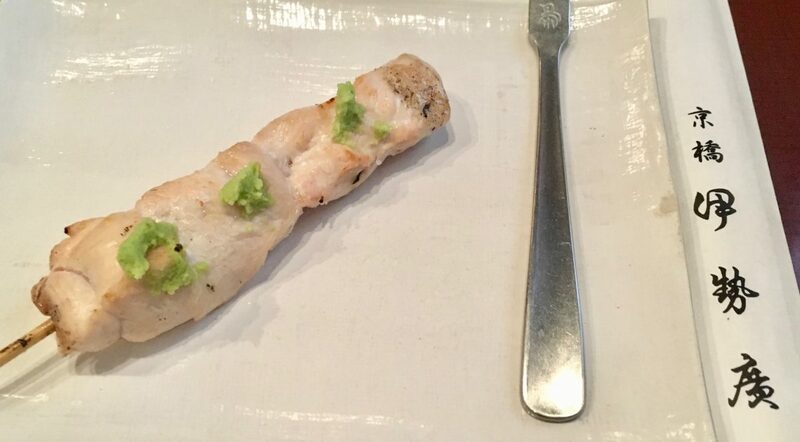 Getting a yakitori served one by one on a white plate makes that plate rather dirty after you had a few. The most popular item on the menu is the dango. 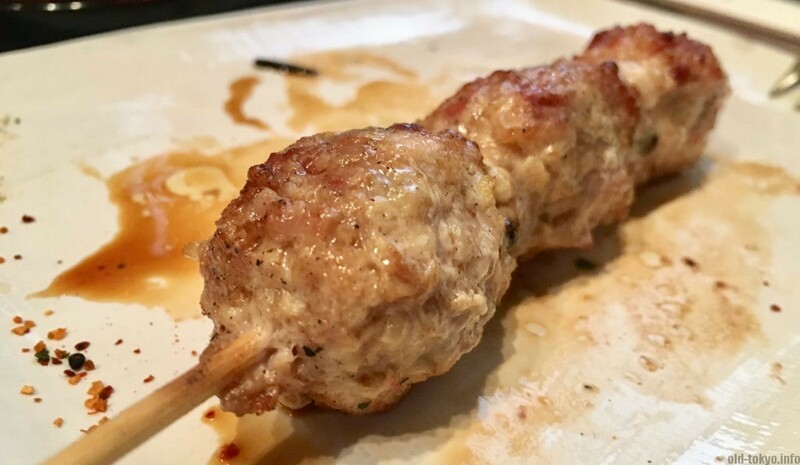 Not a sweet dango, but what at other yakitori restaurants you call Tsukune, chicken meat balls with small pieces of cartilage. Special at Isehiro is that there is no space between the balls, not such a world-shocking innovation, but tasty nonetheless. They are using ubame-binchotan charcoal for an authentic taste. This type of charcoal dates back to the Edo period (1603-1868) when this charcoal made from oak wood from Wakayama prefecture became widely used. My main interest in visiting was to learn more about the taste of Ozu Yasujirō. 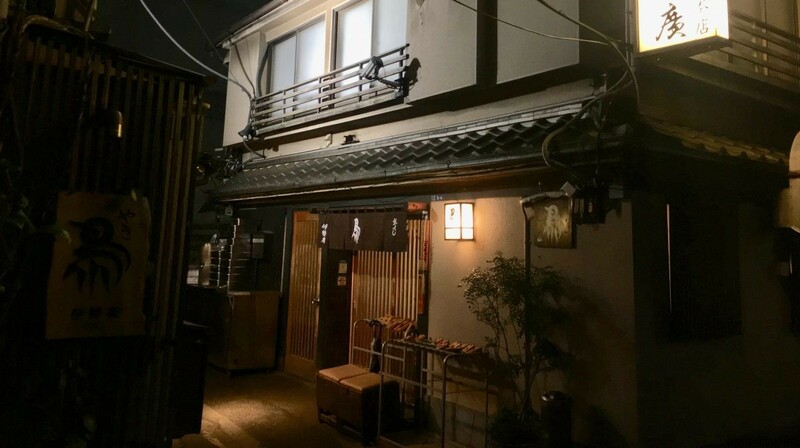 According to the story, he used to have is favorite spot at the back of the restaurant in a small tatami-floored room where he would quietly eat the yakitori and then leave as quietly as he came in. The period he visited often was in 1953. Inside of the restuarant there are no signs regarding his visits. Due to its popularity Isehiro evolved into an upscale chain restaurant. The have a branch in the New Otani Hotel (near Yotsuya), Ginza and Nihombashi. Saturday open until 20:30. Closed on Sunday and public holidays.